The Transform menu applies geometric transformations to figures in your sketches, allowing you to create translations, rotations, dilations, reflections, tessellations, scale models, kaleidoscopes, fractals, and much more. Basic transformations (Translate, Rotate, Dilate, and Reflect) are called similarity transformations because they create images that are similar to the pre-images: the image has the same angles as the pre-image, and all distances are changed by the same ratio. To use these transformations, you can either specify fixed distances, angles, and ratios, or use the various Mark commands to mark dynamic distances, angles, and ratios in your sketch. Iterations allow you to perform the same transformation repeatedly, transforming a pre-image to form a first image, transforming that first image to create a second image, transforming the second image to create a third image, and so on. You can transform both geometric objects and numeric values, and you can specify the depth of iteration. Custom transformations allow you to specify an arbitrary transformation in terms of two points: an independent point and some other point that depends on the independent point. Once you specify such a transformation, you can apply it to a wide variety of objects in your sketch, including other points, path objects, interiors, and even pictures. When you specify a basic transformation (Translate, Rotate, Dilate, and Reflect), you specify not only the object to be transformed (the transformational pre-image) but also certain objects or values upon which the transformation is based. For instance, a rotation requires both an angle and a center about which to rotate. 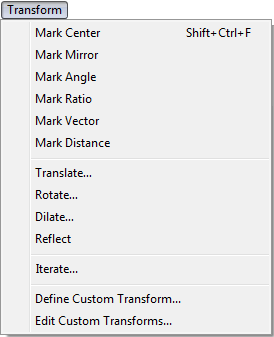 The Mark commands — Mark Center, Mark Mirror, Mark Angle, Mark Ratio, Mark Vector, and Mark Distance — let you specify objects in your sketch to be used for your transformations. These marked objects may be either geometric objects or values. For example, a rotation is defined by a center and an angle. The center is a geometric point about which objects rotate. If the center point moves, then the rotated image changes accordingly. The angle determines how far objects rotate about the center. Rotate by a fixed angle (such as 45°) or by a marked angle (which can be defined by three points, by a marked angle value, or by an angle marker). If a marked angle changes, then the rotated image also changes dynamically. 1.Mark any objects that determine dynamic aspects of your transformation by selecting the objects and choosing the appropriate Mark commands (for example, Mark Center to mark a selected point as the center of rotation). Most objects can also be marked when the transformation dialog box is open, after you choose the transformation command. 3.Choose the appropriate transformation command from the Transform menu (for example, Rotate). 4.In the resulting dialog box, specify any objects or values you want to use in your transformation (for example, click a new center point, or specify the angle by typing 45° or clicking an angle measurement or marker in the sketch). 5.A faint preview image appears in the sketch. Check to make sure it’s what you expect. Then confirm the dialog box to construct the transformed image. Once you mark a parameter, Sketchpad remembers that mark even after you change the selections. If you’ve already marked a parameter for one transformation, you don’t need to mark it again to use the same parameter for a second transformation. The Iterate command allows you to create in a single step multiple transformed images such as this spiral, or any figure resulting from a transformation or construction repeated many times. 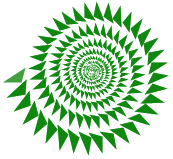 Use iteration to create complex images such as tessellations and fractals. You can iterate not only geometric objects but also numeric values. You can define and edit custom transformations. These transformations allow you to define as a transformation any construction that involves two points, one of which depends on the other. Your custom transformations are added to the bottom of the Transform menu, making them very easy to use. Custom transformations are very flexible, because they can incorporate any sequence of construction steps that begin with a point and end with another point.